Q1) What is your connection with Poetry&Words? I grew up going to Glastonbury Festival every year, and it was the first place I remember seeing poetry performed, so in a sense it gave me my start. 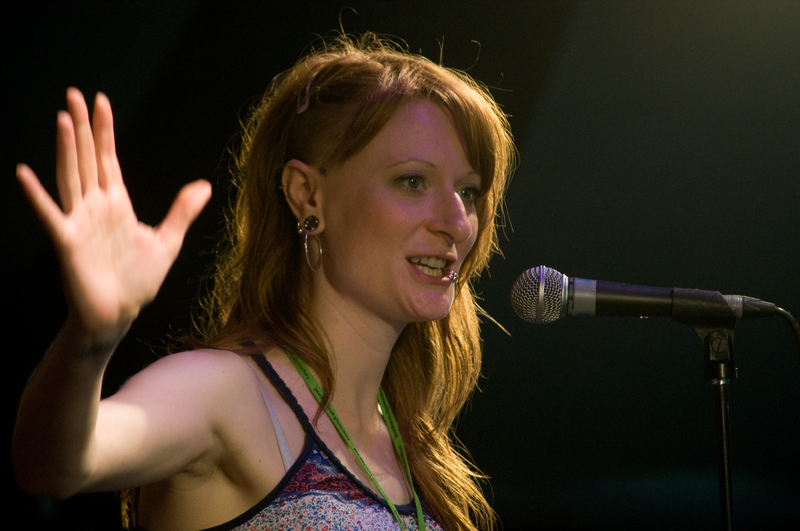 2011 was my first, and so far only, experience of actually being part of Poetry&Words, and it was just such a lovely place to be as well as to perform. My best friend was pregnant at the time so we had a more gentle festival than in previous years. We made Poetry&Words our base and spent four days lounging about, watching a plethora of gorgeous poetry, punctuated by occasional excursions into the bustling madness. Q2) If you had to describe the Poetry&Words stage in just three words, what would they be? Q3) How would you describe Glastonbury Festival to someone who’s never been there? Joyful anarchy… a city in the fields… a reminder that we’re sweaty, smelly, sensory animals, and yet, amazing, visionary beings capable of arranging complex wonders. Q4) Can you name two other poets who you admire? Only two? Arg – difficult. Um… Shane Koyczan is one of my favourite poets alive – his poem ‘Move Pen Move’ still makes me cry, even though I’ve heard it so often I know all the words. And I saw Rob Auton’s show ‘Yellow’ recently, which made me laugh with a kind of bubbling incredulousness. I don’t think there’s another show like it out there. But I could just as easily list another hundred poets I think are brilliant. That might be boring for you, though. I’ll do it later, when I can’t sleep. Q5) What kinds of things inspire you to write? Well, mostly I just write autobiographical comedy. It’s just me, making fun of my own feelings, basically. I’ve just tried to turn my own self-absorption into a reason for people to pay me attention while I talk about myself. Then they clap me. It’s everything I’ve ever wanted. Q6) Where is the most unusual place you’ve performed your work? I mutter to myself in the toilets before most gigs – does that count? Q7) What are you working on at the moment? I’m writing a show with Chris Redmond, supported/greatly enhanced by the musicians from the Tongue Fu band. (Tongue Fu is Chris’ poetry-to-improvised music night that runs monthly in London at Rich Mix, Bethnal Green.) Our show is a kind of spoken word musical comedy, about how different life would be if only we had a soundtrack. We’re a bit over-excited about it. It debuts in January at Bristol Old Vic as part of their Ferment festival and we have all kinds of plans for it after that – we’ll see how many of them come true. If nothing else, we’ve had a proper laugh writing it. Q8) What’s the closest rhyme for ‘orange’ you can find? Q9) Can we have a poem please? Q10) Where can we find out more about your work? This entry was posted in Featured Artist Interviews. Bookmark the permalink.